A lot of us think that going for soda drinks are healthier and safer, or that they contain less calories and therefore they can consume enough without worrying about them adding on extra weight, many of us also think that the zero sugar content is a huge favour done to our pancreas. Well, you may be forced to rethink your soft drink after this reasons. Diet soda contains a lot of unnatural sweetness which contains more intense flavour than the real sugar, eventually, diet soda's dull the senses to naturally taste sweet foods like fruits. Even more troubling,this sugar so called replacements has the same effect as a normal sugar on your body. Artificial sugars trigger your insulin which tells your body to store more fat and in turn will lead to weight gain. According to a study done by the University of Minnesota, consuming a diet soda daily was linked with a 36% increase of the risk of having a metabolic syndrome. A metabolic syndrome is a wide range of conditions from high blood pressure, raised cholesterol,elevated glucose levels and large waist circumference. Which puts people at high risk for diabetes,stroke and heart diseases. Plain and simple, yes you think you are avoiding the sugar and the calories, but in all honesty, you are consuming nothing of any meaningful benefit to your body either.just a whole lot of artificial sweeteners. Excessive consumption of soda could ruin your beautiful white teeth eventually, the problem here is citric acid, which weakens and destroys tooth enamel over a long period of time. Because it is almost no differnt from the normal soda drinks, diet soda's are packed with artificial sweetners that tricks your body and trigger insulin levels, which in turns makes your body store more fat. 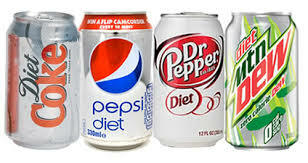 Most People also think that because they have a zero calorie drink,that it is cool to eat more food. If you crave a no calorie drink..your best bet is water. If you are tired of the bland same old taste, you can try flavoured water. These are long term effects of regular consmption of diet soda, it is in no way harmful if you have it every now and then. But prevention is always better than cure.